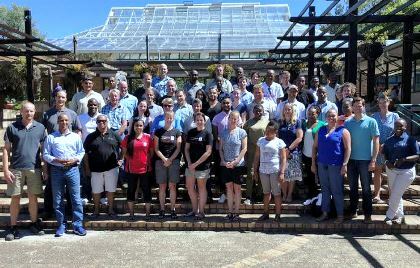 On 7 and 8 February 2018, the second biodiversity stewardship and capacity building training workshop was held at Kirstenbosch National Botanical Garden. The workshop was facilitated by Conservation Outcomes in collaboration with the South African National Biodiversity Institute’s (SANBI’s) Biodiversity and Land Use (BLU) project attracted 55 biodiversity stewardship practitioner participants from a variety of municipalities, conservation agencies, government departments, private businesses and conservation NGOs. Capacity building and development is an integral part of the BLU project. The project was initiated in 2015 to ‘minimise the multiple threats to biodiversity by increasing the capabilities of authorities and land owners to regulate land use and manage biodiversity in threatened ecosystems at the municipal scale’. In relation to stewardship, the declaration process, management plan development, benefits, incentives and post-declaration support, to mention a few are important capacity building and training areas that were identified by project partners in the stewardship space. The fully-packed programme was set in motion with discussions and presentations focusing on biodiversity stewardship principles, legal frameworks and categories of biodiversity stewardship. It included moments to focus on land owner agreements, site assessments, declaration processes, management plans, post-declaration support, benefits and incentives. Highlights of the workshop include the provision of a detailed framework for the legal process to declaration of a stewardship site. The use of case studies was found to be very useful for participants, as most saw value in discussing the case studies by drawing on their daily biodiversity stewardship experiences. The sharing of examples from different regions in order to highlight how the different regions implement biodiversity stewardship processes was beneficial to all. Most participants indicated that they now have a much improved understanding of the legal elements, which is critically important for the biodiversity stewardship declaration and proclamation processes. Ideas for future training were shared and appropriate stakeholders to attend were identified. Suggestions were also made for areas wherein training can be improved. “This training event has highlighted the value of bringing biodiversity stewardship implementers together as it enables lesson sharing and partnership building. We will be hosting more capacity building events in the future, the next training session will have a focus on the legal processes required to declare protected areas.” said Natasha Wilson, biodiversity stewardship advisor at SANBI. Participants received several biodiversity stewardship resources and documentation for them to revisit at a later stage. This highly successful workshop has resulted in it being considered to be conducted on an annual basis. It bears testament to the growth, expansion and strengthening of the biodiversity stewardship community of practice in South Africa. Succulent Karoo Ecosystem Programme (SKEP) institutional partners were in attendance with representation from the Northern Cape Department of Environment and Nature Conservation (DENC), Wilderness Foundation Africa and CapeNature, all of whom are implementing Leslie Hill Succulent Karoo Trust (LHSKT) funded projects to advance protected area expansion and biodiversity stewardship in the Succulent Karoo. This workshop was made possible by project funding from the Global Environment Facility (GEF) 5 Biodiversity and Land Use project. The BLU project is being implemented by SANBI and funded through the Global Environment Facility (GEF) through the United Nations Development Programme (UNDP). For more information contact SANBI’s biodiversity stewardship advisor, Natasha Wilson, on n.wilson@sanbi.org.za.